This Pokemon Movie, I'd have to say was good for the most part. The story plot was FAIR. When I originally heard about the movie, I thought it would be much much much different. Since I've been a Pokemon Fan for most of my life, I was expecting the movies to have much more of a Climatical part. It did not have a true &quot;climax&quot; per se. It was an average movie with an average storyline. The art was nothing special. The best art I saw was at the very end. The art was just as if it was a regular old Pokemon episode. Sound was my favorite part. I loved the theme song in both English and Japanese, and I loved how the ending theme stayed the same. I also loved the song Aracion. Of course, Ash, Brock, and Dawn make an appearance, being the main Characters. I didn't see anything outstanding in the adding of the movie characters. Just like the episodes, there was nothing that made them stand out. When I watch a movie, I want to have somewhat the same thrill of when I watched it the very first time. I want it to be moving. When I watched this movie, I saw it all. I only re-watch it if my friends wants to see it again or if I was going to be in a Pokemon TCG tourney the next day. Overall, it earns a fair 7. It was decent the first time through, but after that, it just gets boring and more boring. 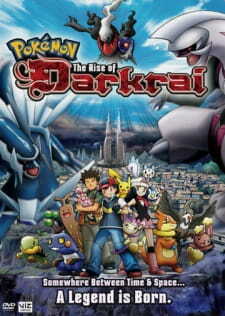 The Rise of Darkrai relies on a big number of epic movie tropes nestled in live action. The film also surprises due to its clear cut structure and by the books approach to various small details. Something Pokemon were ignoring and more often than not, struggling with, ever since the fourth film. Two guys will compete for a girl and it will be shown, not told. The resolution will be clear as the loser stumbles in the background. No exposition needed. Don't get me wrong, by no means is this a masterpiece. What it is, is a highly polished work following all the standard conventions with enough sophistication to be a good cartoon. I wouldn't call any single component of the film bad, but where it does stumble, or at the very least, doesn't shine as the rest, are the characters. The main show cast don't get much attention. Plot expiosition is what they've been used for before and that's what they're used for here. By no means are their lines cringeworthy. By no means are they especially interesting, either. This becomes a hinderance which prevents the film from getting a higher rating, as their wacky shenanigans in the second act, while main plot is on hold, don't hold a candle to what comes before and after. They could've been given character developement or something meaningful to do so we connect to them. Slightly boring and overly silly slapstick dominates a dozen scenes. At least they're watchable. Alice and Tonio are worth a mention. Their simple, but fun relationship subtly embelishes a few moments. Darkrai stole a few scenes, as well. Expecting him to be an edgelord, this was quite a surprise to me. There's a thin line between an unoriginal ripoff and a well executed, traditional story. I've already praised the film for being the latter. One element of the plot stands out, though. Music. Pokemon flirted with this idea in the second film, but didn't have the courage to incorporate Melody's song into the plot. This is fortunate, since the song wasn't exceptional. I'm by no means an expert in music, but I found the song in here pretty good for what it is - an audience mover. While by no means something heavenly, it works well enough that you can accept it as having mythological significance in the film. Artwork for the film was pretty good. Use of CGI for the church, while justified, wasn't nearly as flawless as in some older Pokemon works. Still, CGI was utilized in multiple good action scenes. Action was pretty good in general here. Almost as relevant as in the last film's final action scene, Ash gets to do something again. Ash, Dawn & their pokemon are really fun to watch as they wrestle with time and space to save themselves. There's nothing more to say. It's a highly polished action film with weaker characters than I'd like. Groundbreaking? No. Solid? Yes. Recommendation to pretty much anyone interested. Well, let us start with the Story. It's always interesting - especially in the case of Pokemon - how they made it so far! At that time over 400 Pokémons - and the Franchise seem to be still growing! This movie I just watched because I liked (and I still do so) the 4th Gen. very much! And that's why I came to watch it! And I wasn't disappointed. The storyline has gotten an epic Flair which I really enjoyed. The battle between Palkia and Dialga and, finally, Darkrei as well, was something I didn't expect. That's why I consider the Story as quite fresh, a little bit dramatic and sad. The Sound was just phenomenal - especially the Oracion-theme! WOW! I was thrilled from the very beginning!! I was looking forward to seeing this movie (especially because of Darkrai, Dialga and Palkia). Not a bad film on the scale set by Pokémon movies. The art was beautiful, although nothing out of the ordinary. Still, I liked it, and it stood out nicely for itself. Besides our heroes, the guest stars were okay, and they were given enough background, screen time and character to make themselves useful. The plot itself... the movie started really slow. It seemed to take forever before things actually got going, and by the time the end was near, it didn't feel like much; after all the battling between Dialga and Palkia in the past minutes, the conclusion was nothing special. All in all a good movie, definitely worth the watch, and the story was good if you don't count the fact that they didn't really bring anything amazing/awesome into it. Also, I liked Darkrai's voice more than I have liked other Pokémon voices made into actual speech. It sounded far more... realistic.